It was the premiere for “Share & Shake”, a series of denim workshops, happening during Denim Première Vision in Paris and organized by the denim trade show together with SPORTSWEAR INTERNATIONAL. During four sessions experts from the denim industry talked to SI’s editor-in-chief Sabine Kühnl and senior editor Maria Cristina Pavarini about the future of the denim business and tackled various aspects-from product innovations up to consumer preferences in jeans. Ikeme Eshemokhai, denim design director at Guess, and Travis Rice, fashion brander and almost graduated from AMFI, talked about the interests and tastes of Generation Y and Z for jeans. Eshemokhai explained the tastes of Generation Y, or Millenials, born between the early ‘80s and beginning of 2000s, while Rice commented on Generation Z, including young people aged 20-21 down to the very young who are being born now. For Travis Rice, the Gen.Z don’t care so much for product for the product’s sake, nor for brands. “They mostly care about a brand's position, about the stance they take on cultural issues - nothing to do with the product,” he explains. “For them what counts more is what a brand does.” In fact Gen.Z are those who trust the least of any generation in politics, government and mass media, they rather buy on brands that shape culture as, for instance, tech brands, car brands, cosmetic brands, because they are the ones shaping culture. Even if in the past fashion – and especially denim used to shape culture as a form of counterculture, but now that is not happening any more. The young are waiting and buying mostly brands willing to shape culture. For Eshemokhai, Millenials think that the brand is important but until a certain extent. For them it is about a combination of everything....“The trend, the look, the brand, the fabric and similar aspects are important for Millenials and my generation even if now it’s all about experiences,” she comments. “People in my age would rather spend more for going out to dine rather than for buying a pair of jeans. As brands tend now to make always different collaborations in different fields with record brands, cosmetics for Gen.Y it is all about the story a brand can tell. For Millennials it is also important to learn what secrets are behind a product. 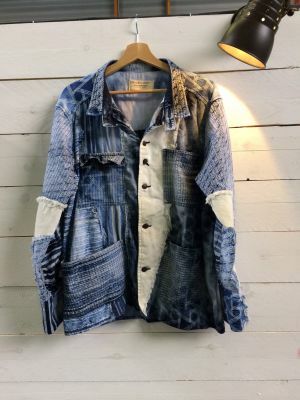 As they don’t know much, for instance, about a denim how it is made and similar aspects it is important for them to know about what secrets are behind them. For Millennials most important to them is the ethic of the industry and human life instead of the environment. Lots of movements were born recently showing how the consumers are really involved and informed. For both sustainability is not negotiable but it has to become the norm. Eshemokhai thinks premium denim is dead as consumers look for price-quality ratio and there is a kind of blur between high and low by mixing Chanel jackets and Zara jeans. Though at the same time also many designers have entered the jeans market taking a position previously occupied by premium jeans brands. Despite this many new brands are popping up right now as, for instance, Girlfriend from LA. Gen Z are very pragmatic and want to spend money. “If quality is there they will buy expensive jeans as they can keep such pieces in their wardrobe for years,” Rice says. Don't miss the next ‘best of quotes’ review of Session 3 coming tomorrow.